Kamen Rider Den-O's Yasuko Kobayashi drafting the scenario. 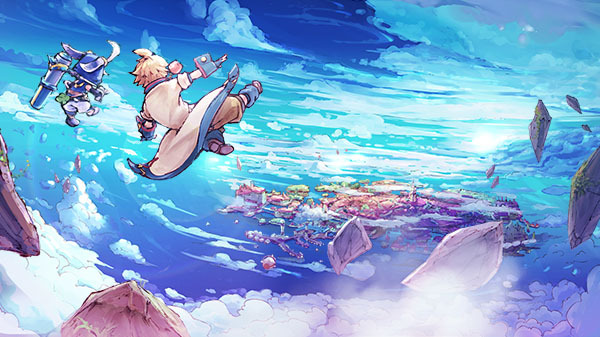 Sega has announced Wonder Gravity: Pino to Juuryoku Tsukai (Pino and the Gravity Users), a new iOS and Android game developed by f4samurai due out in Japan as a free-to-play title with item-based micro-transactions in 2018. “Hugo the Gravity User” and “Neil of Pino” have their sights set on the bottom of the world. This is the story of the endless sky. The setting is “Huitlast,” a world where people live in the vast sky, and where there are no continents or oceans. “Endroll,” the bottom of the world, is said to possess an unknown power. After setting off on his journey to Endroll, Hugo, whose father is on the international wanted list, encounters Neil of Pino, who wants to save his childhood friend, who has fallen ill to a mysterious illness, and becomes a Gravity User. However, due to the journal’s log of a ship heading towards the lower sky obtained from his father, Hugo is targeted by a world-ruling secret organization known as the “World Organization,” as well as other Gravity Users. In order for Hugo to find his father, and for Neil to save his childhood friend, they will set their sights on the unknown depths of the sky that is Endroll. The adventure to a sky that no one has seen has begun. The scenario of Wonder Gravity is being handled by Yasuko Kobayashi, who was the head writer for various tokusatsu TV shows including Kamen Rider Den-O and Samurai Sentai Shinkenger. Studio M2 is handling the opening animation, and Procyon Studio, whose past works include Chrono Trigger and Another Eden, are handling the game sounds.